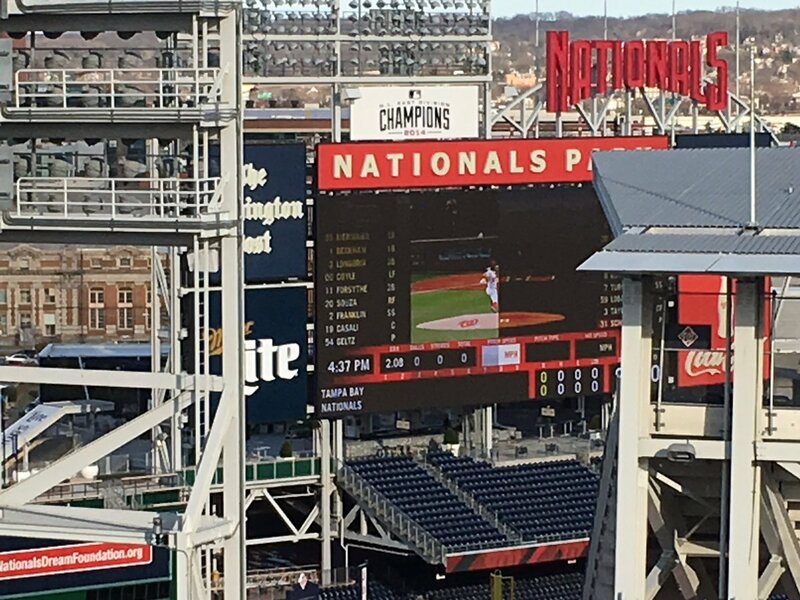 @geneticlyperfct took this shot of the Nats Park scoreboard today showing Pitch Type and Hit Speed(? it's tough to see the text over that next box). A good step towards what they really need, which is the pitch track with location and break. Good to see the additional pitch info. I wonder if they're going to replace the big Miller Lite sign with a Bud sign before the first game. If their Sandlot invite is any indication (and it is), the answer is yes. And they got tons of work to renovate the Miller Lite scoreboard walk. Thanks much. Haven't really looked at the prices in stubhub yet for early season but these are great to have as an alternative. Hell of an angle. Where do you think it's taken from? That would be Mr. Perfect's balcony. If anybody is interested, one of the graphics they were testing out yesterday was something along the lines of post-game concert is postponed due to weather. So it seems they're planning on having post-game concerts this year. Bardo has had their liquor licence denied because the Nats protested against it. The reasons given were that it would be too noisy, too loud to sit next to a baseball stadium. That there is not enough parking, 45,000 fans can get to Nats Park but there is not enough parking for a bar next to the ballpark. That there would be an issue with pedestrian safety, because nobody crosses the street to go to the ballpark. approximately 1,000 events have been held at the stadium in the last eight years. Id. outside the stadium. Id. at 222,236.
inning on game days. Id. at 223. 26. Mr. McCarthy also discussed the public transportation available in the neighborhood. Id. that time. Id. at 223. 27. Mr. McCarthy discussed the parking available in the neighborhood. Id. at 223.
neighborhood will soon lose approximately 2,000 to 3,000 parking spaces. Id. 28. Finally, Mr. McCarthy discussed pedestrian and vehicular safety. Id. at 224.
them to cross between buses. Id. at 226. Need money to offset the MASN money they don't get. The Lerners are going to offer Bryce naming rights as part of his extension. "The House That Bryce Built"
ExxonMobil Field - what those demonstrators back in 2008 were carrying signs in Half street about. "Call your Senator and tell him/her to vote against . 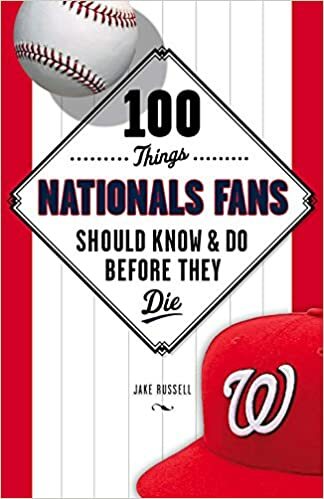 . . Field"
It needs to be "Natty McNatface Stadium"
Northern Virginia-based Haute Dogs and Fries and Maryland-based Pinch Dumplings were named winners of the Washington Nationals’ “Pitch Your Product” competition, the club announced Tuesday. The contest gives entrepreneurs from the region the chance to expand their visibility, with presence at the ballpark as the prize. If they changed anything, they haven't rolled it out yet. Scoreboard is exactly the same as it always has been. Also...why, on the ribbon LED boards on either side of home plate, do they show the W-L record and total Ks for the pitcher (they do this on the bullpen boards too when a pitcher is warming up). Records mean nothing, and strikeouts are useless if you don't know how many total innings they've pitched. If I see a pitcher that has 12 strikeouts, is that over 8 innings or 50 innings? Makes a huge difference. So are you planning to kill him Galah ?